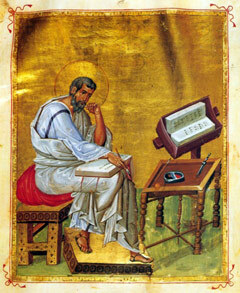 The Christian community traditionally ascribes authorship to Matthew the Evangelist, one of Jesus' twelve disciples. Augustine of Hippo considered it to be the first gospel written, and it appears as the first gospel in most Bibles. Secular scholarship generally agrees it was written by an anonymous non-eyewitness to Jesus' ministry. The author apparently used the Gospel of Mark as one source, possibly writing in Antioch, c 80-85. Of the four canonical gospels, Matthew is most closely aligned with the Jewish tradition, and the author was apparently Jewish. Most scholars consider the gospel, like every other book in the New Testament, to have been written in Koine Greek, though some experts maintain the traditional view that it was originally composed in Aramaic. The gospel is associated with non canonical gospels written for Jewish Christians, such as the Gospel of the Hebrews.